People gather to mark the eighth anniversary of the uprising in Libya’s second city of Benghazi..
Libyans have marked the eighth anniversary of a revolution that led to the fall of longtime dictator Muammar Gaddafi but ushered in an era of instability in the country. Libyans took to the streets of the country’s capital, Tripoli, and other major cities on Sunday to mark the anniversary of the 2011 uprising, which saw the overthrow and death of a dictator. 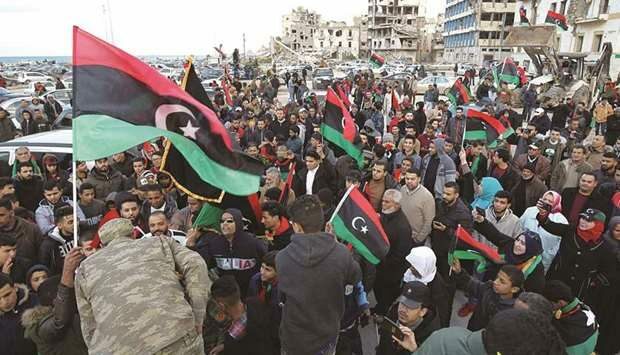 Crowds gathered in the capital’s Martyrs’ Square, waving Libyan flags and chanting slogans as a tribute to the revolution, with security forces deployed to ensure that the commemoration remained peaceful. Similar rallies were also held in the eastern city of Benghazi and Misurata & Zawyia in the west.